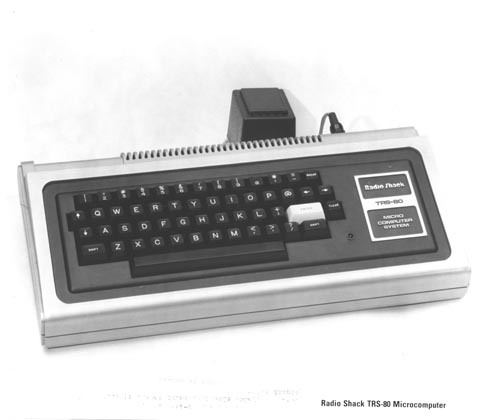 B&W image of Radio Shack TRS-80 MicrocomputerSystem. It has a TRS-80 Video Display, Keyboard and tape cassette. Recto bottom Margin: " Radio Shack TRS-80 Microcomputer"
Verso:metadata " The new Radio Shack TRS-80 Microcomputer System features a built-in 53-key Professional-type keyboard and one of the most advanced microprocessor chips available today, the Z-80. The microcomputer with regulated power supplu, less video displan and data cassette recorder, is priced at $399.95. 7741"